Fidelity lowered its online trading fees for stocks and ETFs to $4.95, down from $7.95. Here is a link to the firm’s schedule of commissions and trading fees. Schwab reduced its online stock and ETF trading fees to $4.95, down from $6.95. At the same time, the firm announced lower expenses on its market-cap index funds. For more information, view its pricing guide and information on its low-cost index funds. E*Trade lowered its standard online equity trading fees to $6.95, down from $9.99. It also began offering an even lower fee for more active traders: $4.95 per trade for 30+ trades per quarter. Here’s a breakdown of fees. TD Ameritrade reduced its online equity trading fees to $6.95. Loyal3 announced that its original platform is closing and being taken over by FolioFirst. Loyal3 provided no-fee trades of certain stocks. Under the new system, individual transactions of certain stocks will still be free. However, there will be a monthly fee of $5 to participate in this program. If you’ve invested with Loyal3, you should have received notification of this change via email; you can logon to your account to get details. The changeover is scheduled to happen on May 22, 2017 according to FolioFirst, but certain actions need to take place earlier if you choose to liquidate Loyal3 holdings on the old platform. Motif Investing will begin assessing a $10 semi-annual fee on low balance accounts with no trading activity. At Motif, low-balance accounts are those with less than $10,000. According to the announcement, you don’t have to pay this fee if you subscribe to a Motif Blue or Impact Account service. The most inexpensive service is Blue Starter, which is priced at $4.95 per month. Here’s a link to pricing details (note: the charge for inactive accounts is slated for introduction on May 15, 2017). TradeKing Advisors is no longer offering its managed portfolios to new clients, following its acquisition by Ally. However, Ally Invest is now offering managed portfolios, starting at a minimum of $2,500 with a management fee of 0.30% of assets under management (AUM). Betterment eliminated its $1/month fee on low account balances; before, you needed to make an automatic deposit of $100 or more in order to avoid this charge. Today, the charge for basic services is 0.25% of assets under management (up to $2 million). Premium services with unlimited access to CFPs via phone is 0.40% AUM and requires a minimum account balance of $100,000. 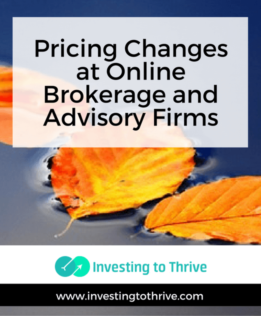 With several changes happening in a short time frame, I've realized that I need to encourage investors to check the latest on the pricing at each online brokerage and investment advisory firm before investing. Have you noticed lots of pricing changes? Do they benefit you?